In the Money Matters: Personal and Family Financial Management Simulation, students encounter real-world scenarios and make the same financial decisions made by individuals and families. This simulation combines reality, student creativity, and classroom flexibility, which promotes learning and increases interest. 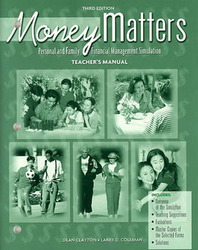 The five units will help students understand life situations in various stages of the financial life cycle: The single person The young married couple The couple with young children (expanding family) The head of household with child A couple nearing retirement Students will see the effects of financial decisions. As they go through the real-life activities, they will have a chance to calculate financial decisions either manually or by using Microsoft® Money, Quicken® Deluxe, or Excel® Software. The Teacher Manual provides an overview of the simulation, teaching suggestions, evaluations, master copies of the business forms, and the solutions.